Where do layout ideas come from? Many originate from observing the prototype (see Scrapbook #92 and watch this space next month). 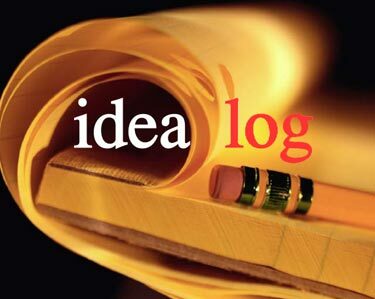 Additional ideas often come from viewing other people’s model work. So here’s a collection of current projects that may inspire your ideas. THIS ‘PRACTICAL PIZZA’ ACTUALLY INCREASES GARDENING SUCCESS! 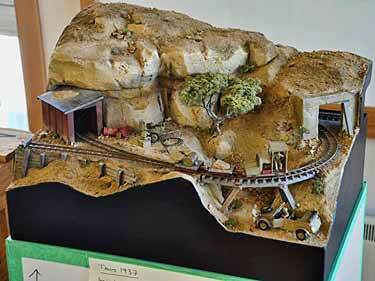 Long-time contributor Jeff Semprebon, from Claremont, New Hampshire USA, reports he has finally been able to “finish” a micro layout, largely because it features very simple scenery—and a very unusual mission. Jeff calls it his Practical Pizza, measuring 42×20½in (1067x521mm). 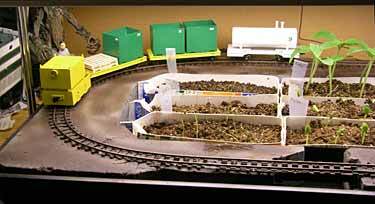 Here’s how he describes his project: “This microlayout (with the central region subtracted, it comes out to just a bit under four square feet) was designed to overcome a problem of seedlings dying due to neglect. The concept was to encourage more diligent care by combining the seed-starting flats with something of greater interest. 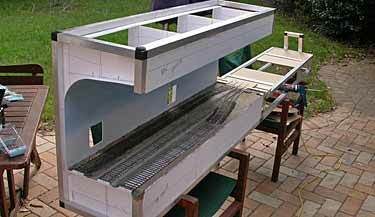 It is built in an ‘English Boot Tray’ with two pieces of scrap blue insulating foam forming the base for the track. A notch cut in one foam piece by the previous owner suggested a cutout for a stream, and a bridge was built up from some scrap Plastruct. 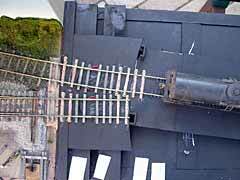 “The track, Peco O16.5, was secured onto the individual foam pieces with Liquid Nails adhesive for projects. 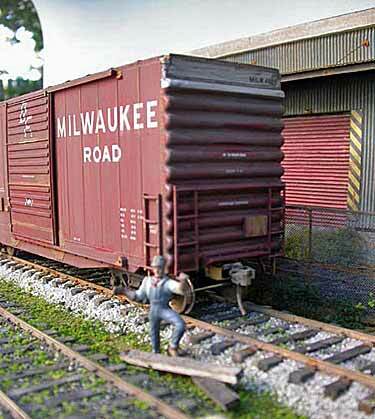 While designed for 1:18 scale (representing one-foot gauge), it has no scale-specific features as yet… The result? So far, use of the layout seems to have reduced my seedling mortality rate to about 40%, down from 100% killed in years past.” Seedlings, as you can see, are contained in cut-down milk cartons. Visible in the finished-layout photo (above left) are, from the rear by row: impatiens and zucchini, marigolds and yellow squash, leeks and tomatoes. 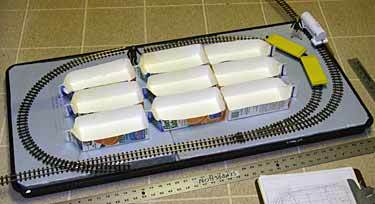 Sounds like a delicious as well as a useful way to enjoy a layout! 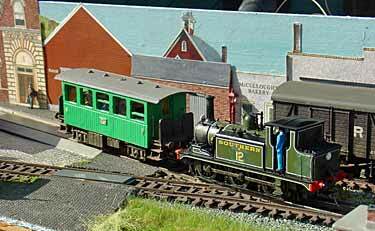 GOOD NEWS FOR NARROW GAUGERS… TWO NEW COMMERCIAL TRAINS Quite a number of readers have drawn my attention to two new product releases in the past couple months, both of H0 scale narrow-gauge Ready-to-Run trains. 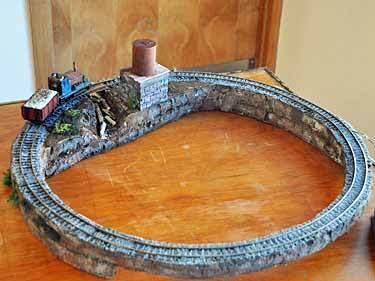 Both of them should make it easier to build small narrow-gauge layouts, especially with mining themes. 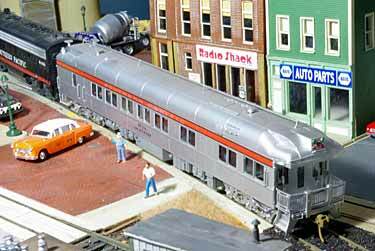 The first (above left) is the return of MinitrainS, originally distributed by AHM in the US, now re-engineered and released by Big City Hobbies. 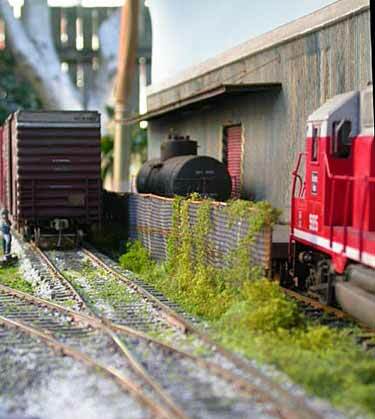 These are H0n30 (1:87 scale running on 9mm tracks) with US Plymouth locomotives. From all reports, it appears that these new locos run significantly better than their predecessors. Thanks to Thomas Schaefer, who was the first to alert me to this welcome reissue. The second (above right) is a mining train released by Busch in Germany. 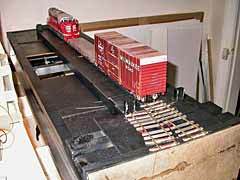 These are H0f (1:87 scale running on 6.5mm gauge) of German prototypes, running on standard Märklin Z-scale track. 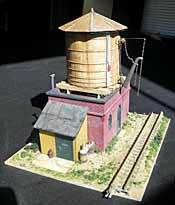 Busch also introduced an impressive range of structures and accessories for mining layouts to accompany the trains. Thanks to Thomas Hentschel, who provided additional information about these new products. I’ll look forward to seeing and publishing some layouts using these exciting new products! 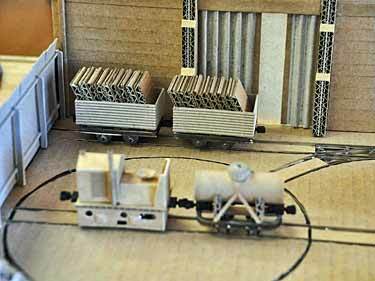 UNUSUAL ROLLING STOCK MOVES CAN SPARK OPERATIONS John Bruce, from Los Angeles, California USA, points out that special movements (often involving special railroad cars) are another way to add operating interest to a small layout. 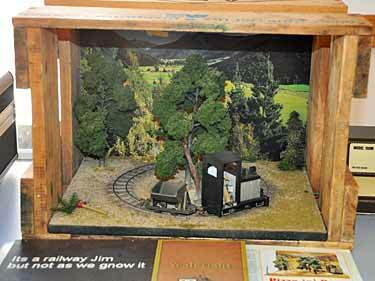 John adds, “I think we tend to get caught up in the idea of [standard rolling stock] and maybe forget about the opportunities occasional special operations provide—certainly on an exhibition layout, but also just for home running or photography. Because some of the cars may be longer than usual (but perhaps not too big for many micros), this may involve a little extra planning for the occasional 89-foot piggyback flat, whalebelly tank car, or whatever.” John sent along some examples, beginning (top left) with a work train special, featuring one of those fascinating Maintenance-of-Way cars that are now available in model form. 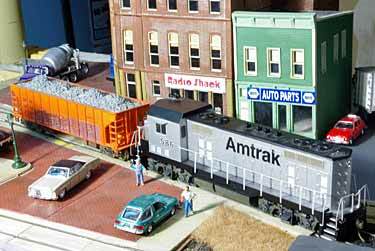 Some other possibilities, which John staged on his new layout (watch for it in a future issue), include (upper right) special passenger or office car runs, like this business car being hauled through an industrial district. Another potential special move (lower left) might be a consist that looks crazy but has a logical explanation, like this Amtrak special work train being pulled by the first loco available at the time it was needed. And finally (lower right) there are high wide moves, that require special care, often (as here) special cars, and definitely special routings. Got a special move consist on your line? Send me a photo… we’ll do a roundup of other Special Moves in a couple months. Full credits will be given, and there’ll be a small prize for the best suggestion (in the judges’ opinion, which is final). Deadline for photos is 30 June 2010. Speaking of Special Moves, here’s one featured on Brooklyn: 3 AM, Prof Klyzlr’s H0 line that actually lives in Sydney, Australia. The prototype line in Brooklyn connected, among others, the New York transit system yards with the car ferry to New Jersey… and so ailing subway cars often trekked over this route, heading for repairs in the Jersey car shops. LIMITING LIGHT CAN LEVERAGE LIFELIKE LOOKS ON THE LAYOUT Carl Arendt’s recent essay in Scrapbook #95a, “How Stage ‘Tricks’ Can Add Enjoyment to Small Layouts,” discussed the dramatic impact of Limbo Sets—settings that surround the modelled scene with black. 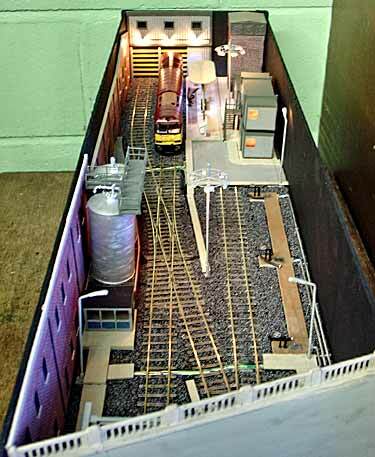 Among others, he used as an example Gavin Sowry’s Gn15 layout, Haywards Estate Railway in Scrapbook #73a, which read: “Another design trick Gavin used is to paint the baseboard around the entire rim of the layout a flat black, including the corners. The effect is to emphasize the layout colors, much the way a diamond is displayed against black velvet.” Shortly thereafter Gavin e-mailed: “Since this was recently topical, I went out to the train shed and set up this shot [below, left]. The secret was not to let any light shine on the backdrop… it’s a black bed sheet, and it was/is full of creases.” Notice how, in addition to hiding the creases, the black surroundings accentuate the colors and crispness of the modeling and add considerable drama to the scene. 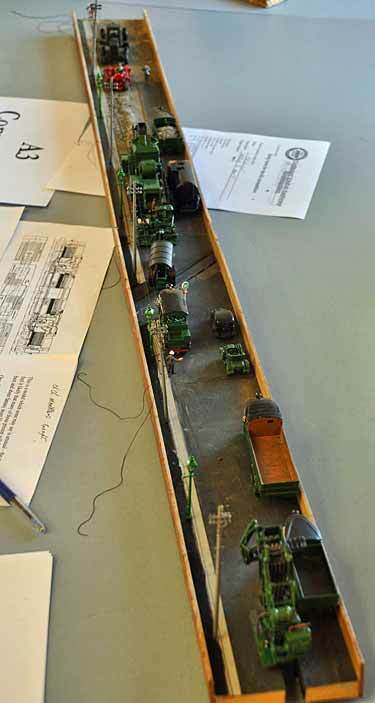 Carl can attest to the accuracy of Gavin’s observation, having used the “black surround” idea to photograph his HO shoebox-sized layout, Carnegie Car Shops (lower right). The limbo set effect makes this tiny layout look more substantial and imposing, because there’s no object with which to compare its size! In Carl’s case, the blackness was created with Black Foamcore art board from Target. No wrinkles! See Scrapbooks #73 and #78a for more. 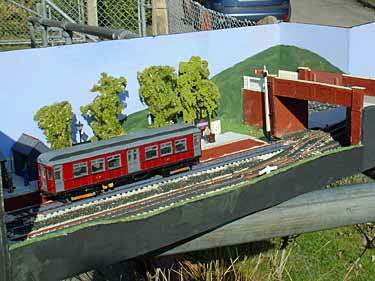 AT LAST… A FULL-SIZED, O-SCALE, STANDARD GAUGE MICRO LAYOUT! 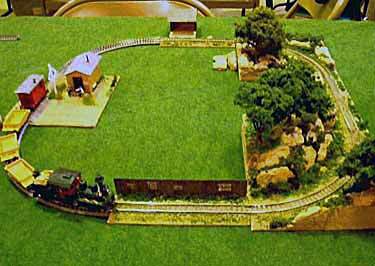 A Holy Grail of micro layout design has long been a full-blown, O-scale, standard gauge operating railroad in less than four square feet. Both Carl Arendt and Casey Sterbenz have made stabs at it (e.g., see Scrapbook #73a), but to the best of our knowledge none has actually been built—until now. Ladies and gentlemen, meet Chicago Fork! 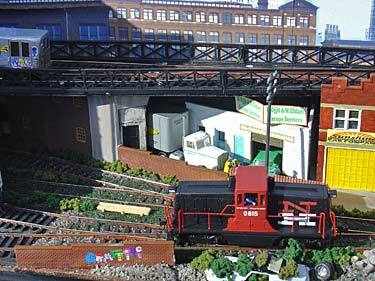 It’s an O-scale micro layout recently debuted by Prof Klyzlr, in Sydney, Australia. It’s a gem! Prof displayed CFRR at a gathering of tough, critical Aussie O-gaugers, who squinted at it, grudgingly spotted a few cars… and found it good! The layout was built to answer a challenge from this hard-core O group. 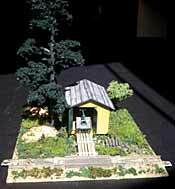 It was also Prof Klyzlr’s first attempt to build a personal O-scale layout. It represents the eastern end of a Burlington Northern runaround loop (passing siding) in a Chicago industrial district, and includes a spur serving the Chicago Fork and Hoist Warehouse. It’s a 3-2-2 Inglenook, with the three-car industrial spur at the rear and the two front lines representing the “main” and “passing” tracks. 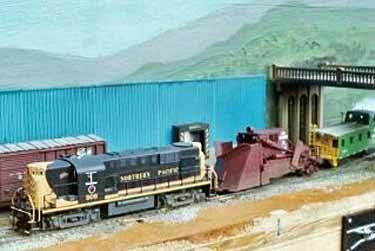 The layout is served by a Central Loco Works brass GP35, two Atlas 40ft Hy-Cube boxcars, a 40ft flat car and 38ft tank car from Red Caboose. Operation begins with a four-car train headed by the Geep resting on the main line (delineated by white ballast). 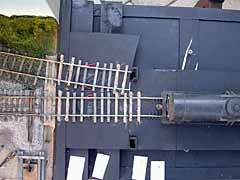 Of course, the main line is only two cars long, so the train overlaps into the sector plate fiddle yard, which measures 95cm (37.4in) long. Three cars and assigned spots are selected, and the fun begins! (Hint: a good first move is to split the train, putting two cars in each of the two front tracks, then go to work from there.) Construction is somewhat unconventional and extremely lightweight (left above). Main materials are 1-inch aluminum channels and 3/16in foamcore art board. The layout was purposely left uncovered even at the show (right above), so that the viewers could see how it was put together. (That’s David Pallas at the controls; Martin “Mad Marty” Hartley is pictured on the home page.) The sector plate was not covered at all, because of the high interest in that area. The picture frame proscenium surrounding the visual portion of the layout is made from foamcore board, inspired by Carl Arendt’s Peek’s Pike. 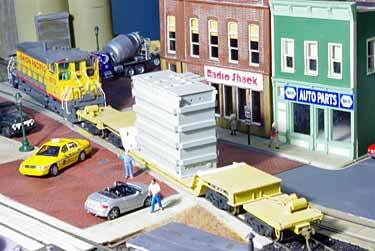 As you might expect, Prof Klyzlr took full advantage of O-scale’s size in detailing the layout. 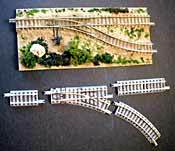 Track features several types of ballast (white for main line, grey for passing siding, black cinders for industrial spur), a handlaid turnout, and handlaid trackage built with scale 39ft lengths of rail. 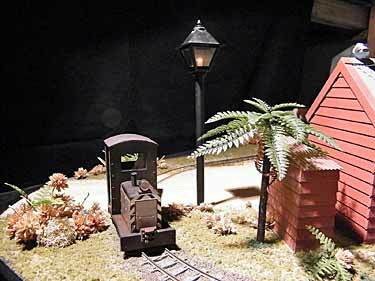 Scenery is basically a “first draft” because Prof’s intention was to sell the layout at the convention (which he did), as there was no room for it in his home! The brakeman figure (left above) marks the clearance point of the tracks leading from the turnout. The sector plate, which generated so much interest, is much like those used in the smaller gauges, only sturdier. Ties (sleepers) form an apron in front of the plate, continuing the #5 turnout angle established on the scenic section. 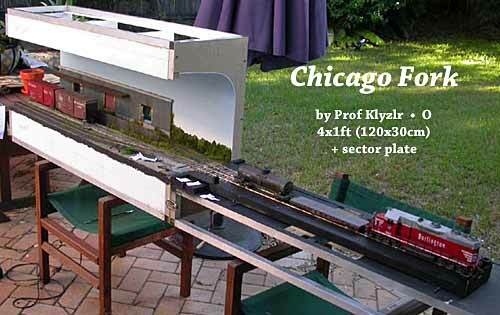 At this time, we have no idea whether Chicago Fork will inspire a renewed interest in very small O-scale layouts, but if it does we will make every effort to show them to you! Game Trains! (left), an online train-operations game, was called to our attention by Mike Allred, from Norco, California USA. 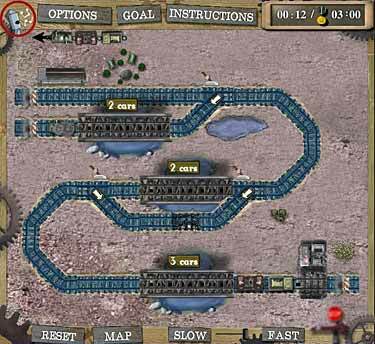 Mike commented, “It’s hailed as an online ‘puzzle game,’ but it is plainly a challenging set of micro layouts.” Warning: unlike the Dawson Station puzzle, this game is not at all realistic. 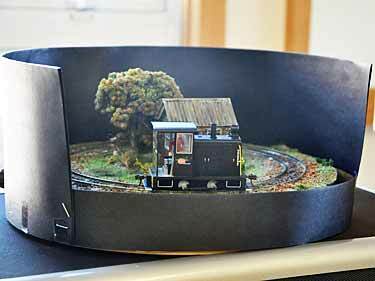 It has many whimsical, and a few magical, features that put it in the realm of fantasy (example: you can turn a locomotive on the turntable without uncoupling it from its train! And wait until you see the Automatic Car Position Exchanger!). That said, Trains! 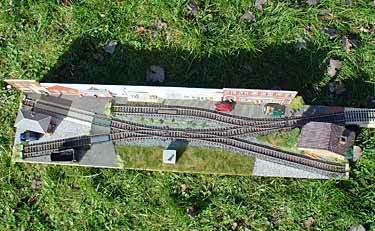 offers 21 different small layouts for you to have fun switching. 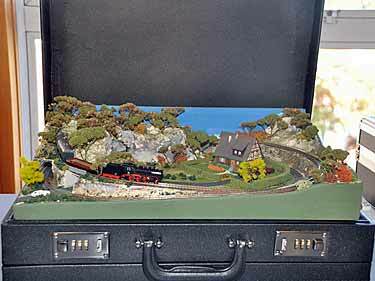 Every two years modelers from all parts of New Zealand gather for the National Model Railway Convention. In 2010 it was held in Christchurch and featured a special competition for A3-sized layouts (no larger in area than an A3 sheet of paper—297x420mm or 11.7×16.5in). Many thanks to Kevin Prince, Will Vale and Gavin Sowry for finding and sending along photos of the entries. 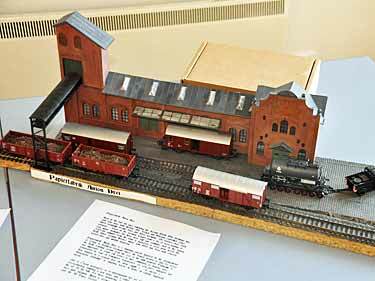 Will Vale’s Gn15 layout, Tanis 1937, won the Best Working Layout award. 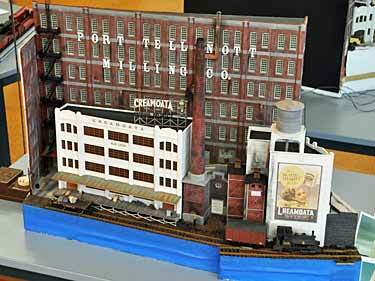 The judges awarded Best Diorama to Creamoata Mill, a model of a New Zealand landmark. 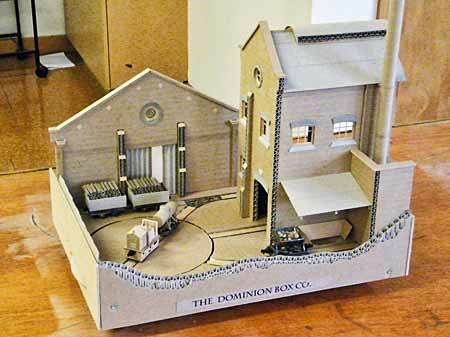 Finally, Tim Marshall’s The Dominion Box Co. won the Accolade for Ingenuity, awarded and presented by Guest of Honour Iain Rice. 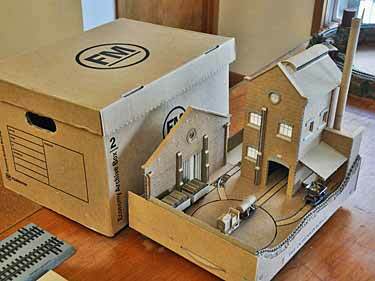 Tim’s model was made entirely of corrugated cardboard, including a working turntable! Kevin Prince organized the competition and provided most of the photos. 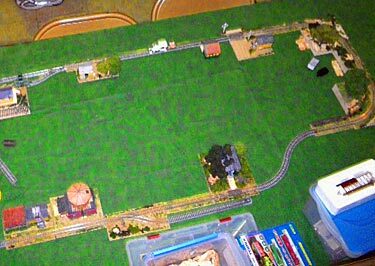 A special thank you to Graham Dredge for filling in the missing layout builders’ names.